Four persons were today charged at the Sparendaam Magistrates Court for the murder of Roger Manikam who was found dead on the Coldingen Public road at the weekend. Manikam’s daughters 19-year-old Nalini Manikam and her 12-year-old sister along with two males were jointly charged with murder before Magistrate Zamina Ali-Seepaul. According to prosecution facts, the murder plot was masterminded by 24-year-old Veeran Dios Lall, who is the boyfriend of the elder daughter planned the crime days in advanced. The court heard that the 19-year-old lured her father to the kitchen where she delivered the fatal blow to the man’s head. The man was killed using an axe. 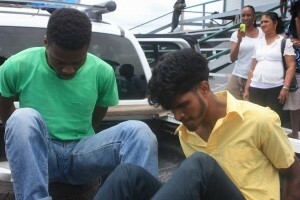 Thereafter the boyfriend was called and he in turn called 22-year-old Devon Browne. Together the removed the man’s body from the home and proceeded to dump it on the roadway. At the court on Thursday, the two men were led out of the court room together with the daughters following close behind. Relatives of Lall, held up fists urging him to be strong but he nonchalantly paid them no mind. Meanwhile, Browne was plagued by a look of stress and was on the brink of tears as he was led to the waiting police vehicle. After the accused murders were taken away from the Court, a stand-off ensued between family of the two girls and relatives of the murdered man. Allegations were made that the mother of the girls orchestrated the murder over the sale of a Lumberyard that was valued $40M.